Regarding Medical Services in Charmouth and Lyme Regis: This event will cover the new arrangements for community services across Lyme and Charmouth, as well as the two Lyme GP Practices, so it is open to all, whether registered at the Charmouth Practice, Kent House or Lyme Regis Medical Centre. We understand that everyone will have the chance to meet, on an individual basis, staff leading the developments for the GP services and community services, as well as CCG officials. Nestling in 26 acres, visitors will find an impressive range of outdoor sculptures in the setting of beautiful gardens, hailed as a modern arcadia. The garden’s design has been inspired by ideas from all over the world and wildlife is also an important element. The sculptures are placed in simple, effective settings for drama and several emerge from the water. There are 30 of Simon Gudgeon’s works on display including Isis, which is also in London’s Hyde Park. Gillian Anderson and Lily James star in this London staging of Oscar-winning 1950 film of jealousy and ambition. Screened live from the Noel Coward Theatre with original music score by PJ Harvey. "Know your Blood Pressure Day"
Sale of Bric-a-Brac Cakes and other Goodies, Books to Browse. Easter Bonnets gather 14.00 at the Baptist Church, Broad Street. 15.00 from the Baptist Church, Broad Street, led by the Mayor finishing at the Jubilee Pavilion on the Marine Parade sea front. Majorettes form part of the parade. 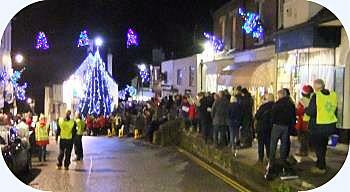 Down the River Lym, In aid of Lyme Regis Christmas Lights. Ducks available from 11.30am on the day at Windsor Terrace (bottom of Woodmead Road). Race starts from there 12 noon. The Annual Town Meeting is not a council meeting. It is a meeting of the town electors and often involves the town council's partners such as Dorset Police and both West Dorset District Council and Dorset County Council. Local organisations who have benefited from council grants are invited to provide a report on their activities and all electors are entitled to attend and ask questions or raise issues. The Town Council will give notice of the meeting through the local press and staff will be happy to advise on the best way of getting items on to the agenda. Come and join us on our FREE Great Dorset Beach Clean at Lyme Regis and Charmouth! Help clean up your local beach and make it a much safer place for wildlife and us. The annual beach clean-up returns as part of the ‘Litter Free Coast and Sea’ week! Bring your friends and family and lend a hand at any of the designated beaches. Please wear suitable clothing and shoes for the conditions: Help to remove plastics and other rubbish from the shore. The vast majority of litter found on Dorset’s beaches is made of plastic, which steadily accumulates if not removed. As standard plastics never degrade, they circle around the world in ocean currents and can cause long-term damage. Whales, dolphins and turtles can mistake floating plastic bags for the jellyfish which form part of their diet. Once swallowed the plastic bag blocks the stomach and leads to a slow death through starvation. Saturday 27th Charmouth We will meet at 3pm at the bottom of Charmouth Heritage Centre steps. Sunday 28th Lyme Regis: Meeting point & Briefing by the slipway near the Cobb, for a 10 a.m. start. Bags, buckets and picker-uppers supplied to give Monmouth beach a spring clean. Stay for as much or as little as you like! All equipment is provided. All children need to be accompanied by an adult. No need to register, just turn up on the day! Please wear suitable footwear and clothing for the weather. Well-known local artist Julie Oldfield returns to the Town Mill galleries to exhibit some of her innovative work, in which she creates dramatic and stunning sky and seascapes using mixed media on canvas or metal sheets - typically copper, brass, aluminum and even stainless steel. She will be giving a talk at the gallery at 6pm on Saturday 23 March. Old notes & coins, overseas coins, banknotes? The Rotary Club of Lyme Regis are collecting them and other money for charity. There are collecting boxes in the Royal Lion Hotel , Serendip Bookshop, Martin Diplock Estate Agents, Lyme Regis and Fortnam, Smith & Banwell Estate agents in Charmouth. So have a look at the back of the drawer or old an old sock where you put last year’s foreign currency that you will never use again as the Club can recycle it - including out of date currencies. To date they have raised almost £1000.00 for good causes. Have you any old used ink jet cartridges laying about? Well the Rotary Club of Lyme Regis have made arrangements with Serendip Bookshop, Broad Street in Lyme Regis to have a collection point for them. The cartridges that can be recycled include those made by HP, Dell, Lexmark, Canon, Samsung and Neopost: Epson or Kodak cartridges can also be recycled via this collection box but see the further reference to these makes below. Lyme Regis Foodbank is run by volunteers to help individuals or families in our community who face a short-term 'food crisis': being without food or means to obtain food owing to temporary financial, medical or social support problems. The Foodbank relies on voluntary donations of suitable products from generous-minded people. Items such as those on this list are the staples of the Foodbank, so anything you can contribute, however little or much, is welcome. An annual event held at the Lyme Regis Golf Club and organized in conjunction with the Rotary Club of Axminster. Teams of four, Stableford, two scores to count, full handicap (max men 24, ladies 30). Organised by the Rotary Clubs of Lyme Regis and Axminster: We can make up teams. 'During the Jane Austen tour we visit the houses in which Jane is said to have stayed and hear stories of Lyme Regis as she would have known it.